Is your business well-adapted to change? James Schramko here and the topic today is you’re going to have to do things differently later on. Some of my students hear me talk about how I switched out of having an affiliate program and how it’s ok for me because I am up and running but they’re not and perhaps an affiliate program is right for them, and it’s true. You may have to do things differently at the start then later on. I used to sometimes speak from stage. I had an affiliate program. And once upon a time, many years ago, I actually did a little launch of my product. I put more effort into having a product release all at once and have people focus on that. Whereas now, I just introduce them into my community. So you do things differently down the track when your business matures and when it grows. So your job as a business operator is to see what’s out there and to see what is relevant for you right now and then remember to continually reassess if it’s still right for you. Because as your business grows and matures and develops, you’ll need to make changes to adapt to the new version of your business. Now in my business I do at a minimum of every three months. Every three months, I fly overseas, meet with the team, go through the business and recheck all of our assumptions to see if they’re still relevant and making those spot checks helps us to make better decisions and that’s why the business is strong and continues to be as best it can be optimized for the current climate, based on where we’re at as a business. So, today’s action step is to ask yourself what assumptions have I made that I need to reassess so that I can grow my business to the next level? I’m James Schramko. This is SuperFastBusiness.com. Catch up with you in the future episode. If you’re enjoying these videos, be sure to share it with your friends. I’d really appreciate that and I’m sure they would too. Are you prepared for any changes? Leave your comments below. I think the inability to adapt is one of the biggest problems most small business owners tend to have, which is ironic given that they’re often in the best position to be nimble and react quickly. It’s symptomatic of the “practitioner problem” inherent in small businesses, where you get so bogged down in the day to day that you forget to look outside your window every once in a while! Innovation is great, should really keep a company fresh and lively, I hear about that from many of your (James’) talks regarding what your team are up to. I guess if a business does not want to innovate, they may as well sell it to someone who will. Cigar + Cognac (or good scotch) cannot get enough! 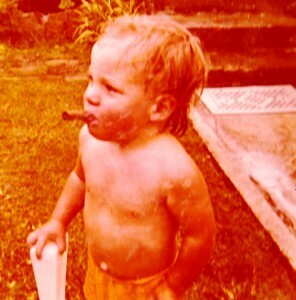 First, the picture of you with cigar (?) is hilarious. Although the thought of innovate or die is interesting, however, it greatly depends on the type of business owner. Small business owners are far too busy trying to maintain their source of income that the thought of innovation is largely a threat to their environment. The need for change (As eluded within the context of this topic) may not be necessary or required. Entrepreneurs, on the other hand, innovate, change, revise and experiment with business models (Pivot) on a regular basis, with the idea of identifying and creating a business that can provide a sense of stability. Ultimately, both the entrepreneur and the small business owner are trying to accomplish the same thing – find something that works and continue growing that something into a successful business. Appreciate the great daily tips & discussion, James! Valerie I wonder how the Video store owner would feel about that. Nothing stands still. Since most small business owners go out of business I stand by my reasoning. When I worked in small businesses we were able to grow much faster by innovating. Peter Drucker said it was all about marketing and innovation. “Drucker defines innovation as the task of endowing human and material resources with new and greater wealth producing capacity. It is not confined to separate business functions but extends across all activities of the enterprise. It provides the means to convert society’s needs to profitable business opportunities.